Alone at Christmas - Or All One? When I was severely disabled and alone at Christmas. I found it very hard for the first few years. However, I was lucky to have a sense of the spirituality of Christmas. Christmas is a holy day. It serves to celebrate the birth of Jesus into the world. 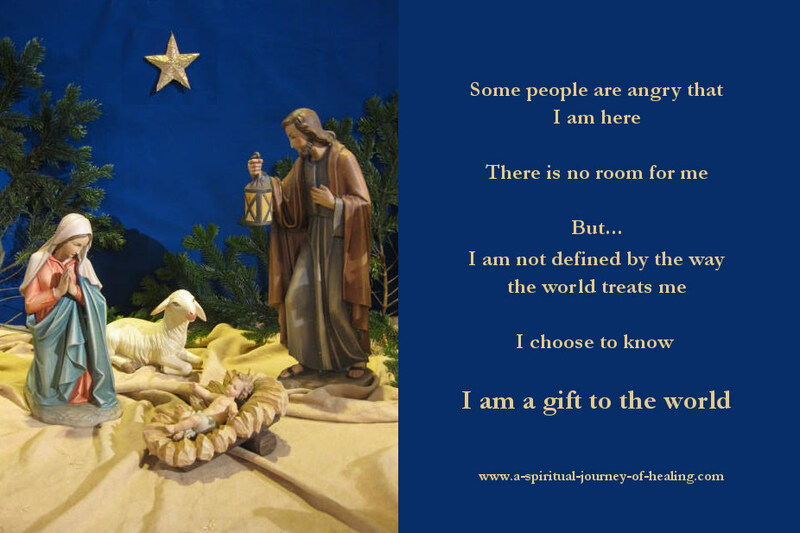 If we choose we can also set side this day to celebrate the birth of Christ within each of us. If God/Love is in all things then God/Love is in you. If you are alone at Christmas, please consider joining your mind with an attitude of calling peace into your mind and heart and thereby into the world. It may not be what you would choose, but when you are alone at Christmas you have the opportunity to celebrate the true message of this festive holiday. Take time to know on behalf of all of us that ‘God is with us’. Find the silence and stillness to hold a vision for the message of Christmas "peace on earth and goodwill to all men". Throughout many years of being alone at Christmas, I looked forward to the sense of spiritual connection as I joined in mind and spirit with all those around the world who were celebrating peace, love and hope in their own ways. Now I am back to independent living, and I share my home with someone. But Christmas day is still a quiet day for me. And it continues to prompt me to connect in prayer with people everywhere. I particularly stop and send blessings to those who are either in pain or physically alone as I once was. If you are alone at Christmas, thank you so much for finding your way to this article. A big thank you from me for being here. This is an expanded version of the prayer from the image near the top of the page. The prayer draws on the story of Jesus' birth. There was no room for him to be born and yet still he was born. or no room, no opportunity for me to express my gifts. I choose to know that I am of you, and so I am A GIFT TO THE WORLD. We have physical as well as spiritual needs. When I was dependent on carers to look after me, Christmas used to be a demanding time for me. Carers would turn up late or not turn up at all. I say the following prayer. Please consider joining me. I ask you to use my mind to enter the lives of those who are vulnerable. I see people with shelter. I see people with enough to eat. I see people with their physical needs provided for. I see people experiencing kindness from others. This may be through financial help, by giving their time or physical help or by setting aside the time for prayer. Thank you for their service. Bless them with many blessings, and bless all those they help. I wrote the spiritual poem below during the years of being severely disabled with Myalgic Encephalomyelitis. The poem refers to the spiritual belief that this world is a dream and that the purpose of life is to wake from the dream into the reality of love. you may feel lonely indeed. It’s OK to feel lonely and miserable at Christmas. If you are alone this Christmas and wish it was otherwise, you have my sympathy. I hope that you will find unexpected riches from spending the day with yourself. Both A Course In Miracles and the Bible talk about the power of joined minds. Many nuns and monks believe prayer to be so important that they dedicate their lives to prayer. Please know that if you spend time praying for people at Christmas, or holding a vision of peace in the world you are doing something that is considered of great value by many people. Thank you. Read an article on How to deal with Loneliness, including a spiritual perspective. Click through to find out how to go deeper with the spirituality of Christmas by applying aspects of the Bible story to your own journey– my prayerful take on things may surprise you!